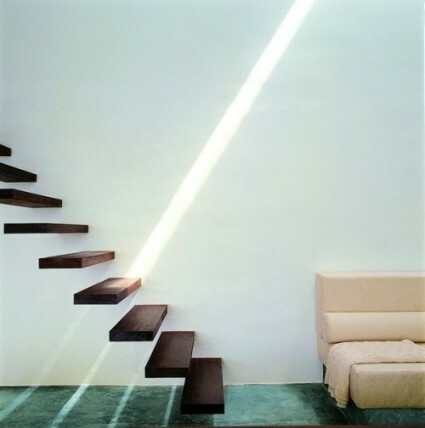 The stairs are an element that unites different levels in a house or building, a functional piece of important visual weight in the structure of a house, such as stairs, may become a piece with character and originality, thanks to the construction materials, to its shape, the lighting or its layout. Decorative trends also cover the stairs, so it is possible to find multiple combinations and styles to create a stairs in an interior as well as current exterior. A staircase model undoubtedly is aesthetically very attractive are those that are made up of demolished steps. Such steps resulting in a striking optical illusion, and is a highly suitable model for current and modern interior design. Demolished steps, which appear to float in the air and this is what makes them so interesting, and are perfect choices to compose a stay in the interior overlooking a pure, stripped lines and ethereal environments, such as the minimalist style. We can find modern stairs which are formed by steps anchored by one of its ends to the wall, and dispense with a railing, so aesthetics will be much lighter than a conventional staircase. A disadvantage of this type of stairs is that its clean and stripped appearance can translate into a lower level of safety during transit it. Considering this point, it will have to take the necessary steps to avoid falls, traversing them carefully and adding a correct lighting to the area, for example. An alternative that offers greater safety to these models of stairs, this are the crystal rails which lightens the volume of that element and remains notion of a structure of modern character and visually light. It is important to incorporate a safety-glass pane for this point of support, to avoid breakage of the same in the event of impact.